For eighteen years the Sustainable Farming Association of Minnesota has been holding conferences. On a nice Saturday in February, 450 people came to St. Olaf to listen to speakers, share ideas, and eat good food. Joel Salatin (from the famed Omnivore’s Dilemma) was the keynote speaker. Jerry Ford from the Crow Wing River Chapter was a major worker-bee of the conference. He is the stinky creator of our wonderful Minnesota Garlic Festival. Next year’s sustainable ag conference is scheduled for February 20, 2010–place to be determined. Mark your calendars and don’t miss out on great conversation and thoughts for a healthier world. 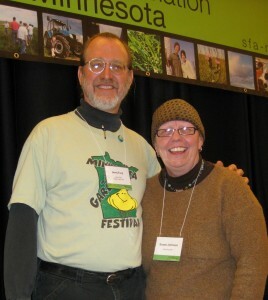 Jerry Ford, garlic festival organizer extraordinaire, and Susan (me) at the 18th Annual Sustainable Ag Conference in Northfield, MN.